Microsoft on Wednesday announced the global availability of Office 365 for Nonprofits for qualifying nonprofits and nongovernmental organizations (NGOs) through its software donation program. The donation is available immediately in 41 countries around the world and for up to 90 countries by July 2014. Ability to access information from virtually anywhere. Office 365 for Nonprofits increases an organization’s ability to work from virtually anywhere with access to documents and files from Office applications optimized for use across PCs, smartphones and tablets. Easy collaboration. Nonprofits are able to work together easily across an organization by using familiar Office applications with email, shared calendar, document sharing and videoconferencing. Easy IT implementation. Office 365 for Nonprofits includes access to easy-to-use administrative controls and the ability to install Office without uninstalling previous versions. Reliability and up-to-date technology. Office 365 for Nonprofits allows organizations to spend less time on IT maintenance, while providing access to always up-to-date technology that is simple and easy to use. And Office 365 for Nonprofits is backed by industry-leading security features and a 99.9 percent financially backed uptime guarantee. Nonprofits and NGOs interested in implementing Microsoft Office 365 can check eligibility and order donations at http://www.microsoft.com/office365nonprofits. Migration information and resources can be found at http://fasttrack.office.com. 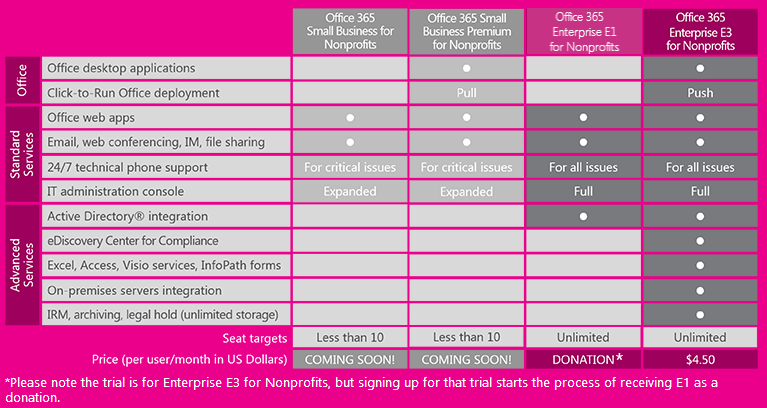 Tagged NonProfits, Office 365, Office 365 Nonprofits. Bookmark the permalink.